On all fronts “Relinquish”, the fourth Aurora Borealis full-length, was a return to the past. Not since “Praise the Archaic Lights Embrace” had the band sounded so overtly death metal. The most important reason for this increase in heaviness and speed can be contributed to a returning Tony Laureano, who by this time had ended his association with South Carolina death metal titans Nile. The album is far more prominently death metal-oriented compared to the previous two albums, and it is heavy and unforgivingly fast to the point of exhaustion. While it is different stylistically from the preceding records it is a worthwhile exploration of Aurora Borealis’ heavier side, and one that could easy match, if not surpass, any of the big league players on the scene that year. The thoroughly annihilating nature of “Relinquish” makes it architecturally closer related to Hate Eternal’s “King Of All Kings” and Krisiun’s “Black Force Domain” than any of the band’s more melodic prior records. Despite the overall increase in speed and percussive density Aurora Borealis retains its European riffing and melodic sensibility. Around this time Tampa, Florida combo Order Of Ennead was pushing a similar sound combined with extensive neo-classical solo’ing. While Order Of Ennead isn’t quite as punishing as Aurora Borealis is here, their big-name cast did steal the thunder of this record. It is plainly better than anything the other band put out. Aurora Borealis doesn’t completely abandon its established epic sound, which a track as ‘Let the Games Begin’ aptly demonstrates. In a time where metal productions were getting increasingly less bass-heavy “Relinquish” prominently features a throbbing bass guitar. Even though it offers far and few actual memorable passages, in the least it can be heard on the album. To hear the bass guitar this clearly had been becoming more of a rarity in recent times, especially in the death metal scene – where sterility, flatness and clinical soullessness was becoming the norm in both professional and home-recorded productions. After two more black metal oriented offerings “Relinquish” instead is in the tradition of “Praise the Archaic Lights Embrace”. The increased death metal aspect of the album can largely be attributed to the greater than before levels of speed, solos, and the percussive density that Tony Laureano brings to the proceedings. Also carried over largely from the debut, and its preceding EP, is the fascination with ancient Egypt and Rome. ‘Myths Of the Light’ is about the significance of light through out history, and mythology. ‘Let the Games Begin’ is about the gladiatorial fights of Rome in times immemorial. ‘Ravaged By Fire’ is about the Great Fire of Rome. ‘God Wills It’ details the occupation of the Dome Of the Rock by the Knights Templar during the Crusades. ‘The Red Flag’ is about piracy during the Age Of Discovery. ‘River Through the Skies’ continues Vento’s interest in ancient Egypt, whereas ‘Tonight We Feast’ is the band’s maiden voyage into Aztec mythology and history. ‘Black Snow’, given Vento’s predilection towards ancient Rome, in all probability is about the destruction of Pompeii by the eruption of Mount Vesuvius. As always Tony Laureano has one of the best drum tones in the business. Much like his colleagues Derek Roddy and Tim Yeung he has a recognizable tone that sounds fantastic regardless of in which band setup it is used. There is something slightly thrashy about “Relinquish”, especially in regards to a track as ‘God Wills It’ with its multiple screaming solos. It is an aspect that was never truly explored within Aurora Borealis, and this deepening out of its sound only show the compositional skill of central figurehead Ron Vento. Once past the halfway mark the album shows its dynamic range with songs that focus less on straightforward blasting. Tracks as ‘The Red Flag’ and ‘River Through the Skies’ are prime examples of Aurora Borealis’ more technically inclined material for this session. ‘Tonight We Feast’ is compositionally closest to the “Mansions Of Eternity” EP. The album ends on an unspectacular note with ‘Black Snow’, which despite the presence of a few very worthwhile drum passages, isn’t quite the big album closer you’d imagine. As per usual the album was recorded at Nightsky Studios in Waldorf, Maryland with Ron Vento producing. 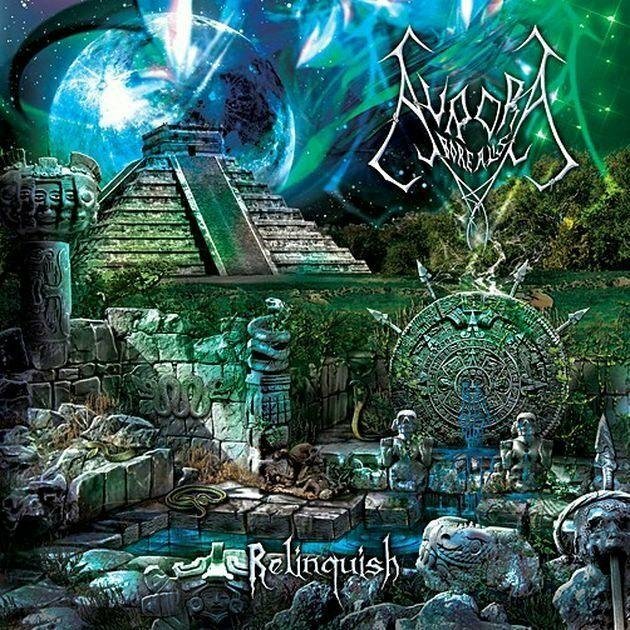 “Relinquish” is easiest the bass-heaviest of all Aurora Borealis releases with a drum tone that surpasses Nile’s “In Their Darkened Shrines” on which Laureano also featured. By all accounts “Relinquish” is the most straightforward of the band’s releases, and its most overt death metal oriented one. This comes in no small way due to the all-encompassing drumwork of Tony Laureano, whose kit features prominently in the mix. 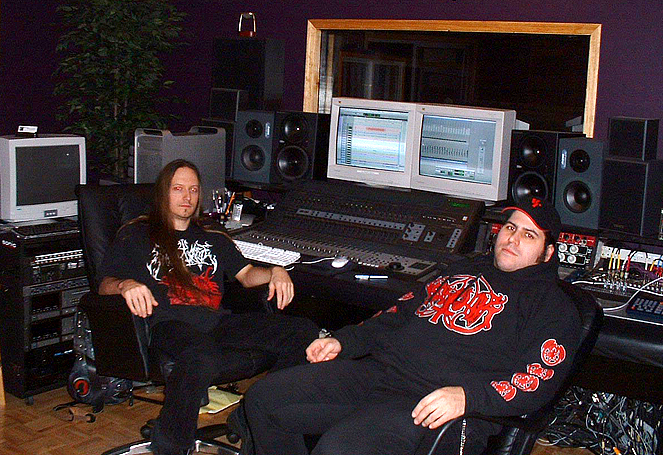 On the visual side there’s a break with the past in that “Relinquish” is the first to feature artwork by Mike Hrubovcak (Divine Rapture, Monstrosity, Vile), who would come to define the more cinematic vistas of the later albums in the band’s catalog. The vista is a neon-lit combination of Aztec, Teotihuacan, Mayan and Egyptian constructions. While accomplished in its own right, it makes you wonder what long-time artist Jay Marsh could have rendered with the same basic outline. As it stands “Relinquish” is the only album of its kind in the band’s catalog to date. The increased level of speed often is detrimental to the grandiose melodies that are woven into each of the cuts, and not even the greater presence of masterful solos/leads can redeem them. Past Aurora Borealis albums would also be speedy, but never to the point of being a detriment to the classy songwriting that emphasized the intelligent lyrical content. While “Relinquish” is a lesser Aurora Borealis album, it is still leagues better than the average production of most underground death metal units. The sheer professionalism that is evinced from the product is something that precious few - even among the big name bands on major labels - can hope to match, or surpass. As a transitional record in between the band’s distinct first – and second era it comes off a lot more favorably, and this is (in hindsight) what it should be considered as. “Relinquish” is as pummeling, and straightforward as Aurora Borealis would come in its US death metal architecture. Without downplaying its Eurpean sense of melodicism and structure, it does prove that Aurora Borealis can easily compete with the brutal subset of the genre.